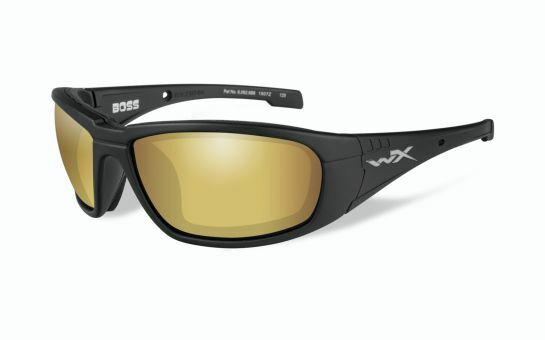 The new-for-2016 WX Boss with Matte Black frame and Polarized Venice Gold Mirror lenses is a pair of sunglasses that delivers the whole package for outdoor enthusiasts…stylish good looks, advanced glare-cutting vision and the proven protection that Wiley X is known for around the world. This powerful combination of features makes this new Climate Control model an ideal choice for boating and fishing, target shooting, or anytime you're outdoors in a highly reflective environment. The WX Boss' wraparound-style Matte Black frame provides full coverage and the perfect counterpart to Wiley X's bold and distinctive Polarized Venice Gold Mirror lenses. With their Amber tint and advanced Filter 8 polarizing technology, these lenses provide superior visual contrast over a wide range of light conditions, for clearer, distortion-free vision with reduced eye fatigue and 100% UVA/UVB Protection with distortion-free clarity. They are especially good for helping anglers read the water and spot fish in the shallows. Wiley X's proven T-Shell lens coating resists scratching in even the most extreme environments, so you can work or play as hard as you want. The Polarized Venice Gold Mirror (Amber) Len s is ideal for sunny conditions, fishing in shallow water and target shooting with a light transmission of 12%. Other lens colors are available for the Boss line including grey and clear. These "eye-catching" mirrored lenses also deliver 100-percent protection against the sun's damaging rays, but this is just part of the story. The new WX Boss' Shatterproof Selenite Polycarbonate Lenses meet stringent ANSI Z87.1-2010 High Velocity and High Mass Impact Safety standards, as well as US Federal OSHA 1910.133(b)(1)(1) Standards, providing true occupational grade eye protection for active outdoor enthusiasts. Wiley X is the only premium sunglass brand with this level of protection in every adult eyewear style it makes…a key reason why the company is a leading provider of vision protection gear to the U.S. military, law enforcement and other tactical wearers. Like all Climate Control Series styles, the WX Boss features Wiley X's patented, removable Facial Cavity Seal that blocks out wind, dust and reflected light for clearer vision, enhanced comfort and relief from "dry eye syndrome." In addition, the new WX Boss is also Rx-ready using the company's innovative DIGIFORCE digital Rx lens technology, combining state-of-the-art Wiley X vision protection with superior visual clarity over the widest possible field of vision. Also included is a black zippered clamshell case, T-peg strap, leash cord with rubber temple grips, microfiber fiber cleaning cloth and instruction card.